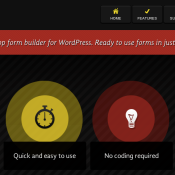 Contact forms are essential on pretty much any website, and while WordPress does not have any in-built functionality to create such forms, there are a number of plugins that are perfect for this purpose. In fact, some of them are much more than contact form creators, you can build any kind of form with them, including questionnaires and polls. Lets take a look at the best ones.